Pro Weld’s, Tanna Oberlander shows the Iron Horse BBQ at the International Association of Amusement Parks & Attractions in Florida ( IAAPA 2007). The Oberlanders continue to participate in OSU’s “Excellence in Business” Award Program. In 2007, Tanna Oberlander was nominated to be an “Excellence in Business” Award Judge. She represented Pro Weld by participating on the Judging Panel with other past award-winning family recipients from all over Oregon. The Award Judges selected nominees (hundreds of application pages), voting on finalists. Upon being selected, finalist competed before their peers who comprise the Judges Panel in Portland (past Award-Winning Family Owned Businesses). The Judging Panel awarded four separate categories of winners (Micro, Small, Medium and Large) to receive the year’s honor of “Excellence in Business”. The family owned businesses selected for each award category displayed their competence in meeting and exceeding the requirement for business succession, and superior business practices for success. Oberlander joined the Award Panel and Award Winners for the “Excellence in Business” ceremonies in Portland, Oregon Fall 2007. Pro Weld Inc. of White City won top honors in the small category, which includes businesses with 10 to 24 employees. Pro Weld specializes in custom construction and technical welding. Judges chose this company because of its ability to involve family in all aspects of business, its innovative business direction, strong involvement within the community, and strong marketing plan. Oberlanders Award Winning Ceremony at OSU’s 2005 “Excellence in Family Business” for Pro Weld with a letter from Oregon Governor. Owned by the Oberlanders, Pro Weld includes James, Penny, Tanna and Eli Oberlander, as well as daughter and office manager Tifiny Skirvin. Pro Weld field welders travel throughout Oregon and Northern California providing a variety of standard and special process welding services. The company maintains a website at www.pro-weld.com. Fully 90 percent of Oregon’s businesses are family-owned, and firms such as Pro Weld contribute more than $24 billion in annual payroll to Oregon’s economy. 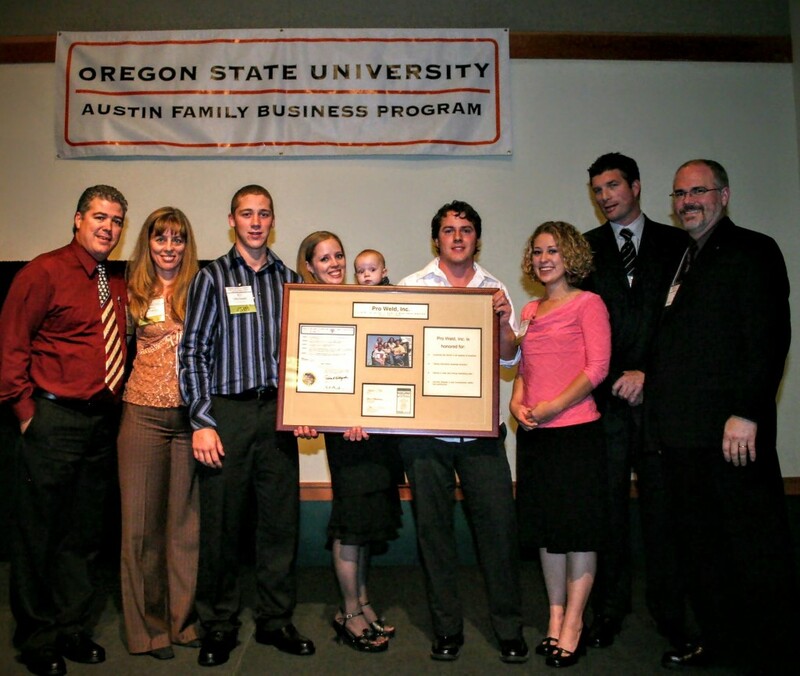 The Excellence in Family Business Awards program, presented annually by OSU’s College of Business Austin Family Business Program, was founded in 1988 to applaud the accomplishments and contributions of family businesses. The Austin Family Business Program works to provide service and support to family-owned businesses through workshops, training seminars and OSU’s family business management course. For information about the Family Business Awards or the Austin Family Business Program, call (800) 859-7609 or visit www.familybusinessonline.org.